What is your musical background composed of? Since I was two years old, I was exposed to carnatic (South Indian classical) music and I did western chorus and acapella. I also started exploring hindustani music as well. As my interest in music grew stronger, I wanted to expand my passion to include instruments. I learned how to play the tabla at twelve and the dhol at nineteen. 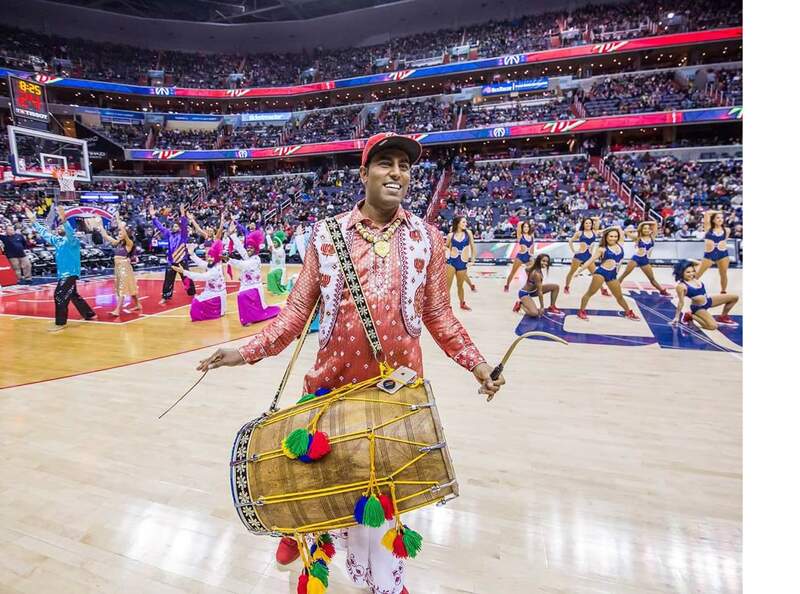 Being South Indian, what made you want to pursue the Punjabi culture by playing the dhol? The first time I saw the dhol being performed was life-changing. In 2007, Mitch Hyare came to my school and played the dhol alongside RDB. Hearing the power, feeling the energy, and seeing the swag all inspired me to pick up the instrument and try it out next to him on-stage. It was one of the most exhilarating experiences of my life. One year later, I performed at Apna Virsa Apna Punjab, a competition in Richmond, Virginia. After it was over, a member of one of the competing teams told me to quit playing because I am not Punjabi. This negativity just pushed me to want to become better at something I was passionate about. What was it like to learn how to play and what is your style compared to others, in a competitive setting? My knowledge and experience with playing the tabla was the perfect foundation for me to learn the dhol. Though both percussion instruments are different, the skills I needed for both were partially intertwined. My style, compared to others in the circuit, is about merging the beats from the dhol with the music from the set. I play to highlight the mix. What type of events do you participate in? I have been involved with many different events over the years. I have performed at collegiate competitions with various teams, weddings, birthday parties, club events, government celebrations, and social awareness rallies. I love getting the opportunity to share my passion for music with the community. What moment do you consider your biggest accomplishment and why? I think my biggest accomplishment is the ability to show my musical talents for civic engagement purposes, held at some of the world’s most iconic venues. Some of these locations include the White House and the Pentagon! I am also incredibly grateful to have met influential people, such as Kailash Satyarthi, Joe Biden, Jay Sean, Pramila Jayapal, Hasan Minhaj, Kal Penn, Dr. Vivek Murthy, and Sree Sreenivasan, who have helped empower me to dream big and work harder. It has been a dream, and still is a dream, to be able to play live at a reputable competition. I have had a few chances to do so, but unfortunately circumstances did not allow it at the time. Soon after, I was given the opportunity to prove myself and, to my surprise, at one of the biggest competition that took place in my hometown. Elite 8 Bhangra 2015, with FCB, has been my favorite performance so far. I am a huge Dragon Ball Z fan. I love to travel and check out amazing food places. I am looking to start a food blog called "Thyme 2 Turnip the Beet." Juice, especially pineapple juice, is my "caffeine." I do not drink coffee, tea, or energy drinks.